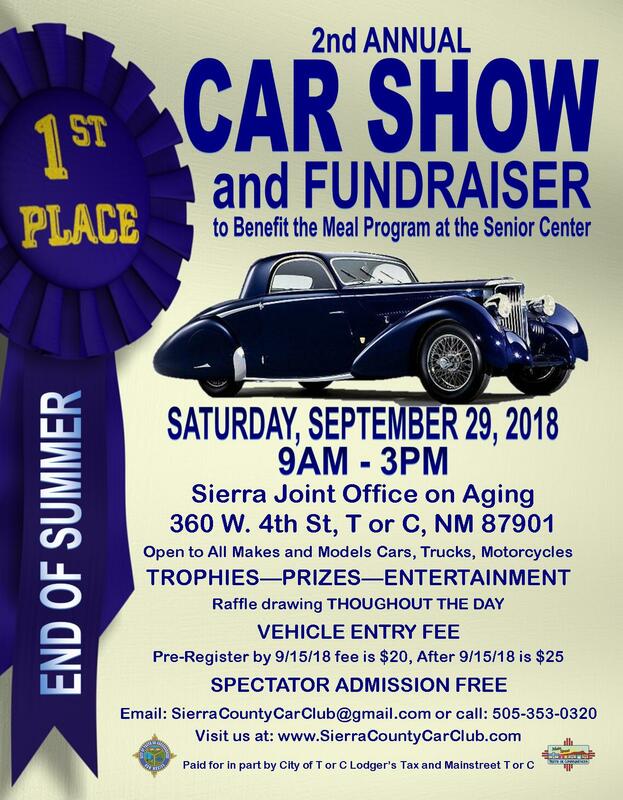 Please join us for the 2nd Annual End of Summer Car Show and Fundraiser to benefit the Sierra Joint Office on Again (our local Senior Center meal site). Come on out to the SJOA in Truth or Consequences, NM and show your support for a great cause. The SJOA’s mission statement is: “Establish a continuum of social support and health services to meet the needs of elderly individuals and maximize their independence, enabling them to live successfully on their own terms in their own communities. The goal is to ensure the use of all available resources.” Our goal at the Sierra County Car Club is to help those organizations in our community to do what they do best — serving the needs of our community. The show is open to all makes and models of cars, trucks and motorcycles so bring your Mustang, Corvette, 41 Ford, De Soto, Model A, Harley Davidson or any other vehicle you would like to show off. Registration fee is $25 per vehicle or SAVE $5 by registering before September 15, 2018. FREE event t-shirt with every paid entry PLUS a dash plaque for the first 20 paid entries. So register early and claim your goodies! SPECTATORS ARE FREE! We encourage everyone to bring a new or gently used winter clothing item (coats, scarves, gloves, hats) to help support the SJOA’s winter clothing drive. TROPHIES! TROPHIES! TROPHIES! In case we haven’t mentioned, there will be TROPHIES awarded to the top performers (presented at 2:00pm). RAFFLE! RAFFLE! RAFFLE! Remember last year’s raffle? We had nearly $1300 worth of raffle prizes from local and national vendors so bring LOTS of money and win your share of the loot. This year is shaping up to be even GREATER. We will be giving away a 60″ Sharp UltraBrilliant LED TV to one lucky winner. LET THAT BE YOU! Raffle drawings will take place throughout the day so you will have plenty of opportunities to win. Raffle tickets are $1 each, or 6 for $5. Net proceeds to benefit the meal program at the SJOA. For more information or to register online, visit us at SierraCountyCarClub.com or send an email to SierraCountyCarClub@gmail.com.